If the rumors are true then the progression of this drama is peaking. Though people still have doubts of GHS, I still think she is better than non-established actress. She has more experience than the wonder girls or the rest of the girl singers. I have previously mentioned that the I like the leads to be real actors than singers trying to move into the acting. It's a risky thing especially if you're going to be in a very highly anticipated drama with the other dramas before it to live up to. Sure GHS is not the ideal choice but I have faith in her to do her best. Therefore I'm glad that both Makino and Domyouji will be portrayed by actual actors. It's the least that I can ask for. I totally agree with you! We all have our 'ideal Makino' and which actress fits the image of Makino but like you, I'm glad that the PD chose GHS, my ideal makino wasn't her but the more I look at her, the more I can see why the PD chose her. I'm glad Domyouji will be potrayed by an actual actors though I must admit I totally love it that Rui is going to be play by Hyun joong. I saw an episode of him in Nonstop 5 and he totally matched the 'cool, quiet character'. DSPE recentely released a letter to explain the schedule changes for their idol grould SS501. end of the year. So we decided to briefly explain what would be going on. Everyone knows already about Hyunjoong filming KBS drama "Boys over Flowers," right? very busy since a lot of filming will take place overseas. please be aware that the date might expedite. the release of their official 2nd album will unfortunately be delayed. in the start of November. The Project album will be released during November. Putting a different meaning of triple ( usually means 3 in English ) in front of 'S' as in SS501, we decided on the name tripleS. We think that this period will be a special experience for all the members. starting from the project group TripleS to Hyunjoongs drama and Jungmin's musical. after a very long wait. We are very excited about this concert. I hope a lot of you can make it to the concert. ^ Since it's overseas, I wonder if they DID decide to film at that fancy hotel in Macau? I remember seeing a picture of it in a blog somewhere. 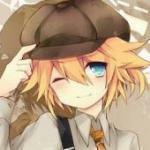 >.< Rui played the so called bad guy in there >.< . O well Excite me then. Maybe it would turn out like Goong. LOL. Well maybe since it's the some production group as goong. You never know. I don't know any of the lead guys in this version. The only one i know is the girl because i saw her in the daily korean drama 'pure 19'. I'm not so sure how to feel about the release of the korean version since I really love the japanese one. I'm afraid it will be compared a whole lot to the korean version, which might sadden me. But looking on the bright side, they may end up like Meteor Garden where they would be more faithful and stick closer to the manga. Afterall, kdramas run longer... I've always loved how the jpn version took all the important elements from the manga and molded it into something new without offending loyal HYD manga fans. It was brilliant really. However, there are times I wished that the japanese version featured other arcs in the manga... showed the story as it was written. I guess it's somewhat of a dream come true. I think I'll warm up to the pretty actress sooner than later. The new Korean drama, Boys before flowers, recently revealed the casting crew and some details of the upcoming drama. This is a drama that has romance and comedy written all over it, and is getting set to broadcast on KBS2. The drama is planning to air this winter and finish next year on February. 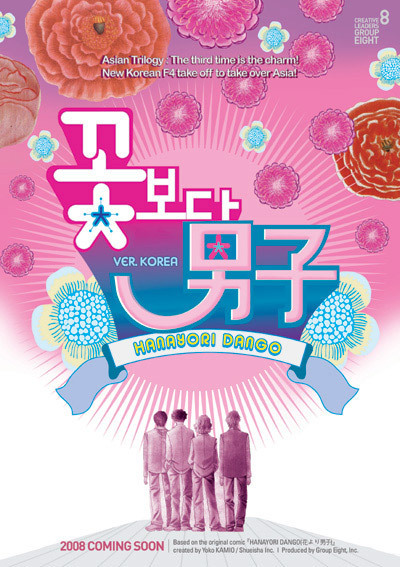 This is another remake of the hit Japanese comic book, Hana Yori Dango. Koo Hye Sun is going to play Yeon Woo (Makino Tsukishi), Lee Min Ho is playing Goo Joon Pyo (Domyouji Tsukasa) Kim Hyun Joong is going to play Yoon Ji Hoo (Rui Hanazawa), Kim Bum is going to play So Yi Jung (Sojiroh Nishikado), and Kim Joon is going to play Song Woo Bin (Akira Mimasaka). This new drama has 24 episodes and is about a girl named Yeon Woo, which is just an average girl, that owns a dry-cleaning shop with her family that is located near the rich and well-known Shin Hwa College. Yeon Woo bumps into the four most richest and spoiled boys while she is delivering laundry to the school. This rich, spoiled boys are known as the F4 and will cause trouble to people who try to speak against or about them. It is airing on Mondays and Tuesdays in Korea. i SERIOUSLY love LEE MIN HO!! he is a great actor. i can't wait until he comes out!!! i can't wait until this drama comes out!!! ^u sure that dramawiki is right about Han Chae Young will play Kim Huyn Joong's love interest??? I CAN'T WAIT FOR THIS DRAMA!! I WISH THAT KIM HYUN JOONG COULD BE THE MAIN GUY FOR THIS DRAMA!! LOVE HIM IN "WE GOT MARRIED"!!!! well, han chae young is pretty and charismatic..
buT I hope the shizuka's character will be played by hwang bo..
since she is older and they already have the chemistry, it'll be great..
^ Though I totally love joongbo on WGM, i think han chae young would be really awesome as shizuka! !